I live in Irvington, a neighborhood on the eastside of Indy. And I work downtown. So five days a week, 50 weeks a year, for the past 8 years, I drive the same stretch of East Washington Street twice a day. That is four thousand times that I have passed 1417 East Washington Street. That is 4000 times that I've looked a building situated behind a well landscaped lawn, tucked in between two not-so-well maintained buildings, and have wondered: "What the hell is that place?" Across the front, a sign that proudly proclaims "Indianapolis Liederkranz". I had no idea what that meant. It just made me even more curious. It wasn't until late last year that I discovered that the Liederkranz is a German singing club dedicated to the promotion and preservation of German culture. One of several German clubs, I should point out. Coming from a German-American heritage, I made it my mission to go inside the club and see what it was all about. That opportunity came last Saturday. 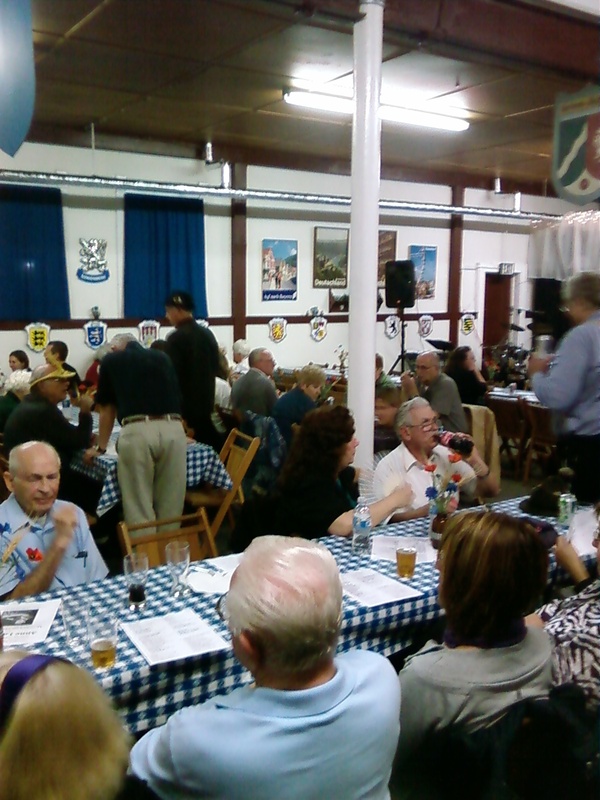 The Liederkranz hosted their annual Oktoberfest celebration. Members paid $3 for admission; the public could join in the fun for only $7. 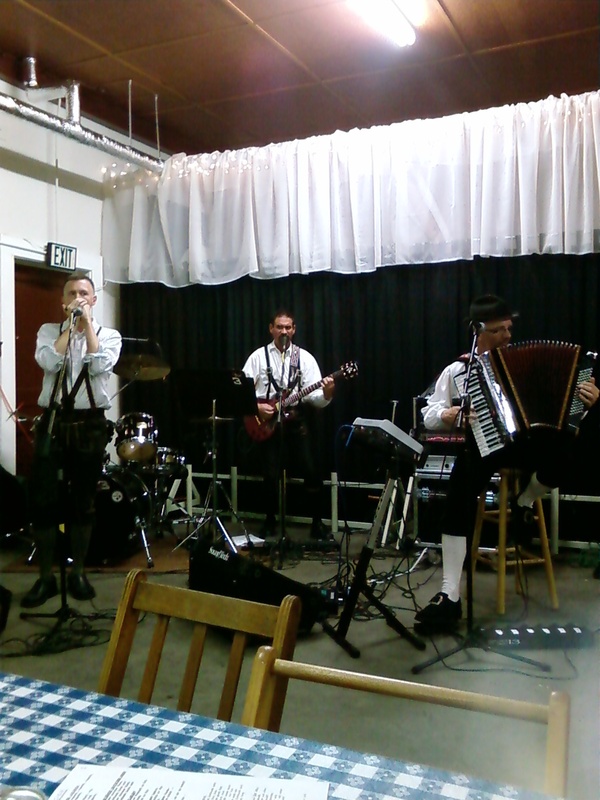 I dragged KOTBR Mike and my wife along for an evening liederhosen, polka singalongs, bratwurst, and, of course, beer. We entered the building from the Washington Street side, stepping into a lobby. Beyond the lobby and coat check is a large, simple hall. In here, tables and chairs were lined up. At the far end, the Alpine Express band was playing (drums, horns, and accordion). Next to them, several couples were dancing. Along the wall to the right was a table selling sausages, sauerkraut, and German potato salad. Next to that was the bar, hidden behind a Bavarian facade. 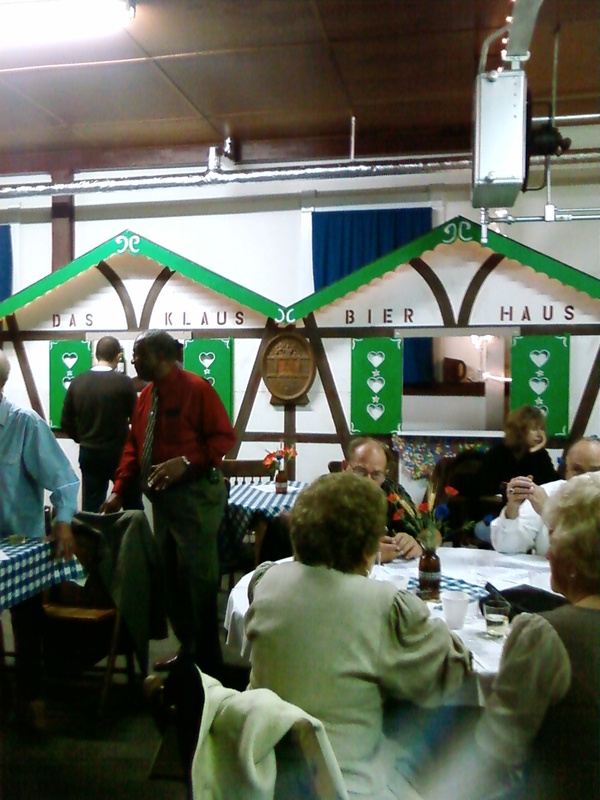 Inside the bar was a keg of Warsteiner Oktoberfest at $2.50 a cup and a variety of bottled German beers. They also had some big brewed domestics, but I didn't see anybody drinking that. 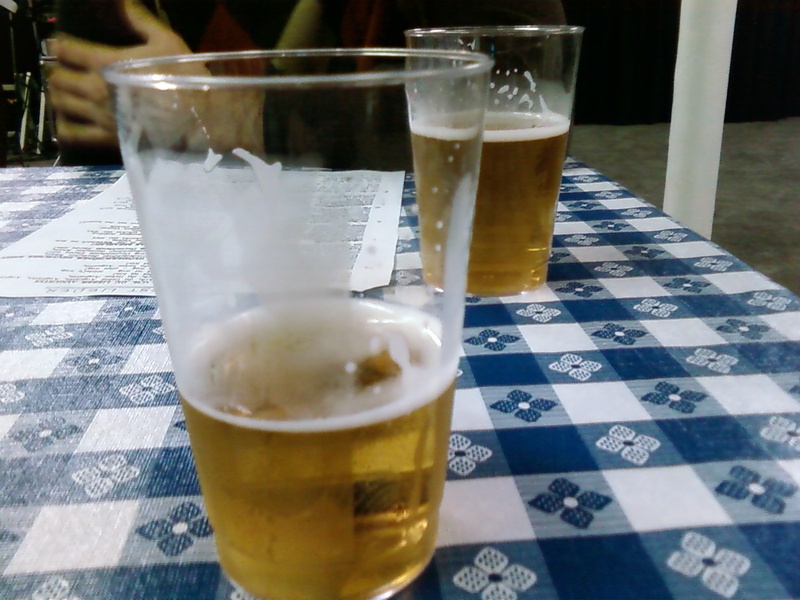 Speaking of the beer drinking people, most of them were, um... more mature than I. Not that I have a problem with that. There were a few younger individuals. While initially I felt like I was getting stared at because I was a stranger, it didn't take long for people to come up and talk to us. They're Germans; they have no problem with being up front and in your face. They may have been older, but most of them danced. 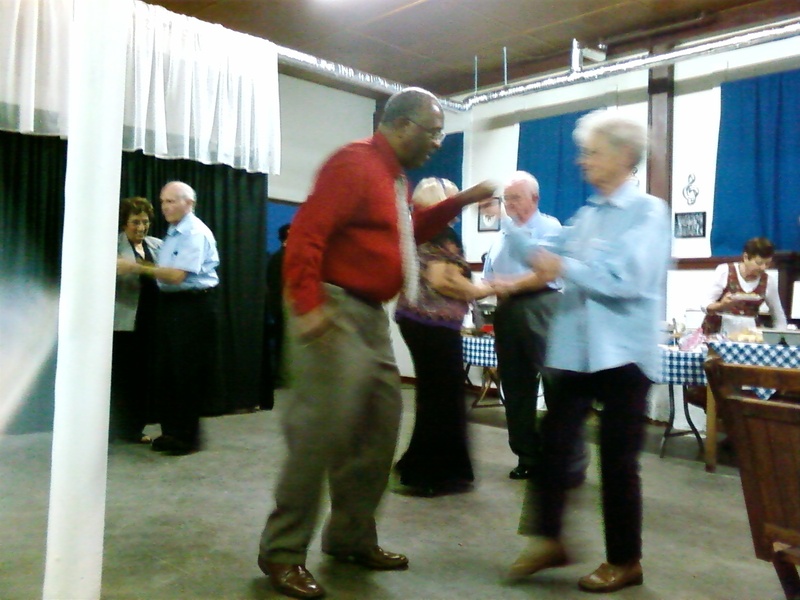 Polkas, German line dances, waltzes... they did it all. The band played lots of traditional German songs, but mixed in a couple of American songs (including one Jimmy Buffett song...much to my pleasure and Mike's dismay). There were song sheets on the tables too, so that you could join along. Several Ein Prosits and Zicke Zacke Hoi Hoi Hoi's were had. During an intermission, we headed upstairs to see what was there. Up front was an old bar with two taps and several beer coolers. Again, German beers are the theme here. The draft beer prices were the same, but of particular interest, for $3.50 they will refill your personal stein that you bring from home. Past the bar is the auditorium where the men's and women's singing groups perform. Membership at the Liederkranz is $25 a year for individuals and $50 a year for families. 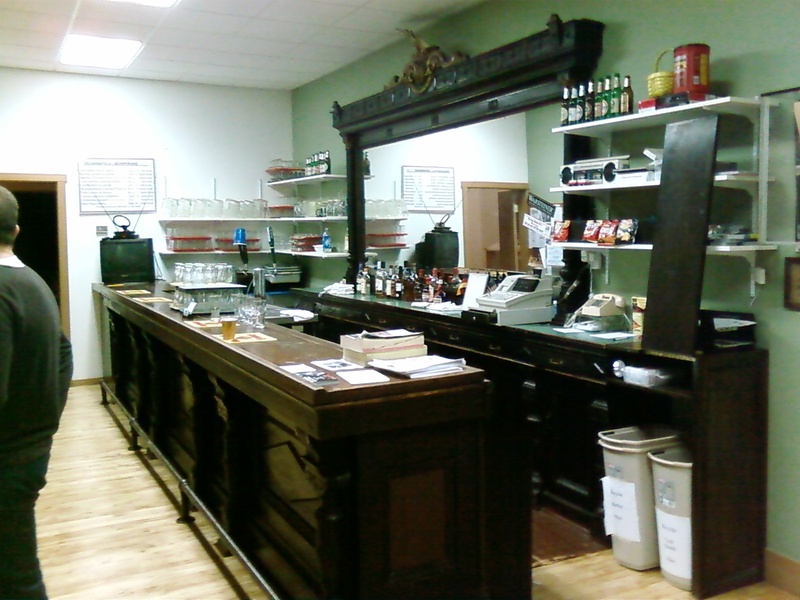 The bar is open to members on Wednesday evenings (which is choir practice nights) and before event nights (they do cabaret and other shows that are open to the public... check out their calendar here). I've been to many social clubs before, mostly ones named after various animals. This social club seemed different. Despite the generational gap (or two) between myself and the majority of the members, we had a lot in common. German heritage. Enjoyment of a polka. Ability to drink stein after stein of German beers. A love of sausage and leather pants (and not in the perverted kind of way). I could see myself joining someday in the future (maybe near...maybe down the road). I think there are many people who could join and fit in. And I've been told that if you like playing skat, you'll be in good company. I'll have to make sure I learn that game before my next visit. Dang, I was there until you mentioned the Jimmy Buffett. But seriously, I've gotta go here. Damn, Jason--now I can't get the Chicken Dance song out of my head. I suppose I'll have to use "Hava Nagila" to wipe it out. As the Liederkranz bartender all that he said is true, and more. The two choirs sing independently, the Damenchor concert is 14 Nov., call 889-6913 for tickets. This show is always a sellout. The Mens concert is 21 Nov. General admission. Christmas is the only time both choirs sing together. This year our concert will be on 13 Dec. with a combined choir of over 50 voices. So come and join us you will not be disappointed! For more concert details call 266-9816 if not a Wed. leave a name & number and we WILL get back to you. 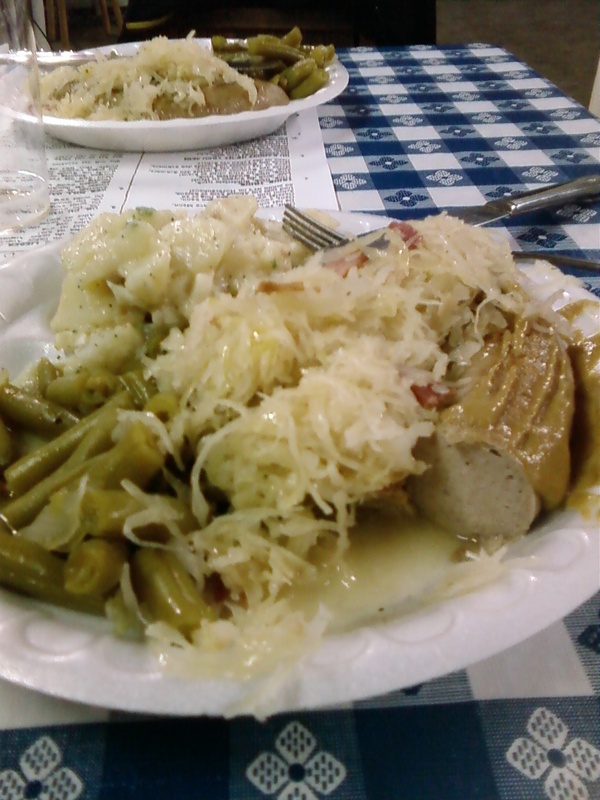 Jason....thank you for this WONDERFUL write-up on the Liederkranz! We are very grateful. I'm so happy to hear you enjoyed yourself. Thank you for that geat post Hoosier Beer Geek! I'm one of the bartenders at Liederkranz and your post reiterated the comment I've heard from many a new customer..."passed this place so many times and wondered what the hell is this place?" Once they finally stepped inside, many a satisfied customer have enjoyed the great beer prices, friendly and inviting atmosphere, delicious German food, and get-up-and-dance music played by great bands, love Alpine Express and Freudemacher. Several events are coming right up. Join us for fun and entertainment. You won't be disappointed!